Living kidney donor Brian Glennon met his recipient Hayley for the first time on the Megyn Kelly Today Show. Brian’s donation started a 58-person kidney donation chain. No. I donated altruistically. We were able to start a kidney chain that currently stands at 58 people—29 recipients, and 29 donors. It has been an amazing experience, and I am thrilled to be a part of it. I am very grateful for the life I live, and I wanted to give back in some way. I had a special place in my heart for organ donation and realized that I was in the right place in my life, both physically and mentally to be able to donate. For me, it was not a tough decision. I went to a symposium on living donation and thought about donating for about a year. During that year I met numerous living donors, listened to their stories and was truly inspired by what I heard. Then one day I woke up and decided it was something I wanted to do. 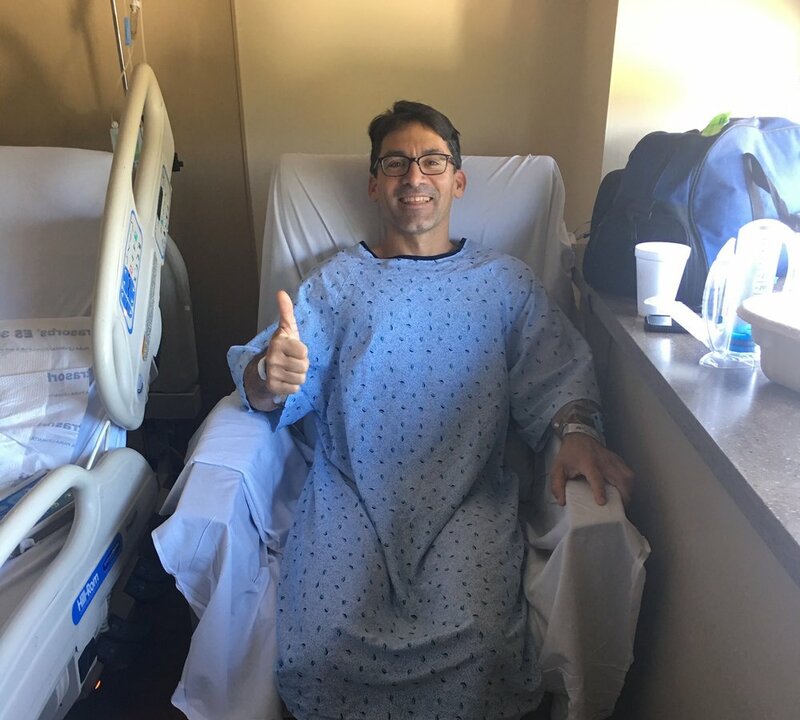 Brian gives his thumbs up after his successful kidney donation surgery. Brian had his wife and kids’ support from the minute he told them he wanted to be a living kidney donor. My biggest concern was my children. Once the medical team determined that I have no history of kidney disease in my family and my children will most likely never need a kidney, I felt much more at ease. If by chance one of my children ever do need a kidney, I was told that because I donated my children would move to the top of the waiting list. My wife and children were supportive from the minute I told them. The main reaction from other family and friends was “Why?” Once I explained my desire to help others and give back, most everyone responded in a positive way. Some family members still couldn’t understand and were worried about me, understandably. I assured them I would be fine, and I was going to donate regardless of their support or not. Once I was home and fully recovered everyone felt much better about my decision. My surgery went off just as I was told it would. We were right on time with no surprises. All went well. Recovery in the hospital at first was a bit painful. I was told it is surgery and there would be some minor pain, but I had never had surgery before and didn’t know what to compare it to. The second day was a bit more painful than the first for me. My pain was mostly in my core area. It felt as if I did 5,000 sit-ups. My abdomen is not used to being stretched out so much (the abdomen is enlarged when they fill it with Co2 during laparoscopic surgery). I stayed over two nights in the hospital and went home the third day. Day 3 after surgery I was feeling much better. Recovery at home got better day to day. The most difficult part for me was trying to take it easy. After a few days at home, I felt much better and wanted to do more around the house. I had to remind myself that I still needed to heal and overdoing it would only slow my recovery. I walked daily and on the sixth day after surgery went on a 5-mile walk. I was back on my bicycle one month after surgery and was feeling back to my old self six weeks after surgery. I am very active and was able to resume all my pre-surgery activities after the six-week recovery period. Remembering that I had actual surgery. Just because it is laparoscopic doesn’t mean it is not surgery. You still must take it easy and not over do it. You need to make sure not to lift anything heavy for a while. Also, I couldn’t drive for two weeks, so that was a little challenging. I am a stay-at-home dad, so I returned to work as soon as I got home from the hospital. I made sure not to lift heavy things for several weeks. I also do some contracting work and was helping build a deck two months after surgery. It was about seven months from the day I walked into the transplant center to the day of surgery. Lots of medical tests, blood work and learning in those seven months. It was all a positive experience for me. I have been very surprised by all the people reaching out to me and thanking me for donating. I would never have imagined how my donation would touch the lives of so many people. Not only through the kidney chain that we were able to start but random people that have had a connection to kidney disease or organ donation. I have said that my life has been better since I donated, and it is. I have met extraordinary, positive and caring people. I see a side of humanity that not all people get to see. I see the best in people, and I am truly honored to be in the company of such individuals.